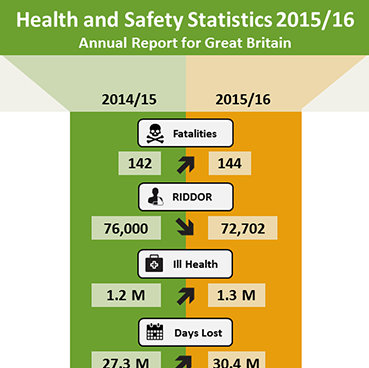 The health and safety statistics for 2015/16 have been published by the HSE and are available at the following link: http://www.hse.gov.uk/statistics/index.htm. In summary, compared to the previous year, work-related fatalities, ill health and days lost are up by 1.41%, 8.33% and 11.36% respectively. However, non-fatal injuries, economic cost and enforcements are down by 4.34%, 1.4% and 8.26% respectively. Below are the statistics in more depth. Around 13,000 deaths each year from occupational lung disease and cancer are estimated to have been caused by past exposures at work, primarily to chemicals and dusts. An estimated 1.3 million people who worked in 2015/16 were suffering from an illness they believed was caused or made worse by work. Of these, 0.5 million were new cases which started in the year (LFS). Around 80% of self-reported work-related conditions were musculoskeletal disorders or stress, depression or anxiety (LFS). The estimated rate of self-reported work-related ill health, and specifically musculoskeletal disorders, showed a generally downward trend to around 2011/12; more recently the rate has been broadly flat. The rate for stress, depression or anxiety has been broadly flat for more than a decade (LFS). The majority (85%) of new cases of work-related ill health reported by participating GPs in the THOR-GP surveillance scheme, during 2013-2015, were musculoskeletal disorders or mental ill health (THOR-GP). Estimated working days lost per worker due to self-reported work-related illness showed a generally downward trend up to around 2009/10; since then the rate has remained broadly flat (LFS). 152,000 led to over 7 days absence. Being injured handling, lifting or carrying (20%), slipping or tripping (19%), and being hit by a moving object (10%) were the main kind of non-fatal accident accounting for around half of all non-fatal injuries. Note: Non-fatal injuries to employees are substantially under-reported by employers, with current levels of reporting estimated at around a half; and the reporting of injuries to the self-employed a much lower proportion. In total, an estimated 4.5 million working days were lost due to self-reported workplace injuries, on average 7.2 days per case (LFS). There has been a long-term downward trend in the rate of fatal injury, although in recent years this shows signs of levelling off. The rate of non-fatal injury to employees reported by employers fell in 2015/16, continuing the long-term downward trend.